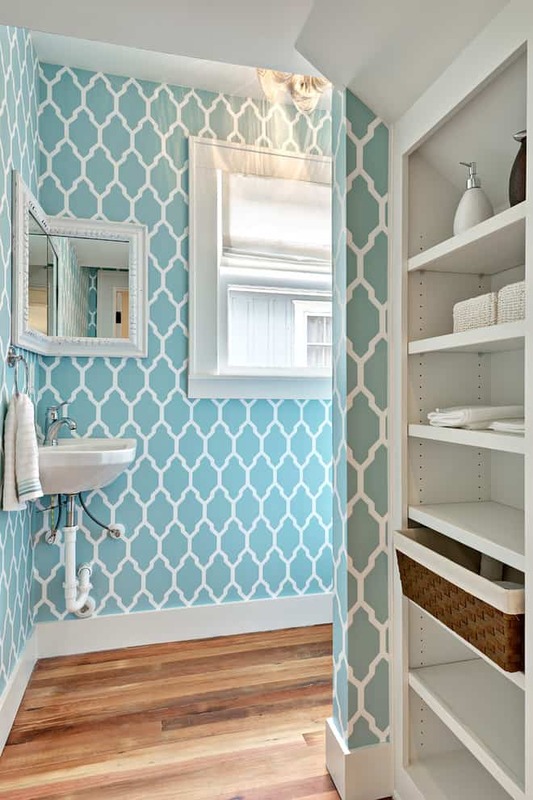 We love this cheery bright Tiffany blue and white geometric pattern for a powder room. You can tone down and contrast a busy wall print with white trim, shelving, and washroom appliances. 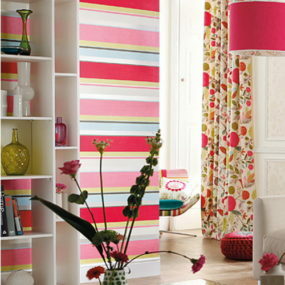 Printed wallpaper doesn’t always have to be bold and in your face. This gentle floral paper is subtle yet entirely lovely. Accent the walls with white trim and bathroom basics but the pale colours allow you to have some fun with details like a rose gold vase and whicker basket. 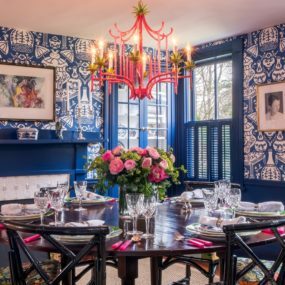 Choosing an upwards pattern like vertically pointing diamonds elongates the room from floor to ceiling creating the illusion of more space. 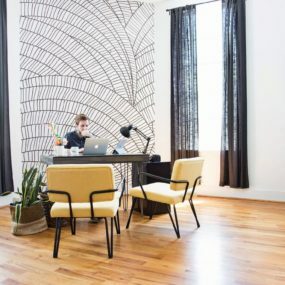 Additionally, although this wallpaper keeps with a simple grey, the white accents and framing allow for a second pattern design to happen with the flooring. 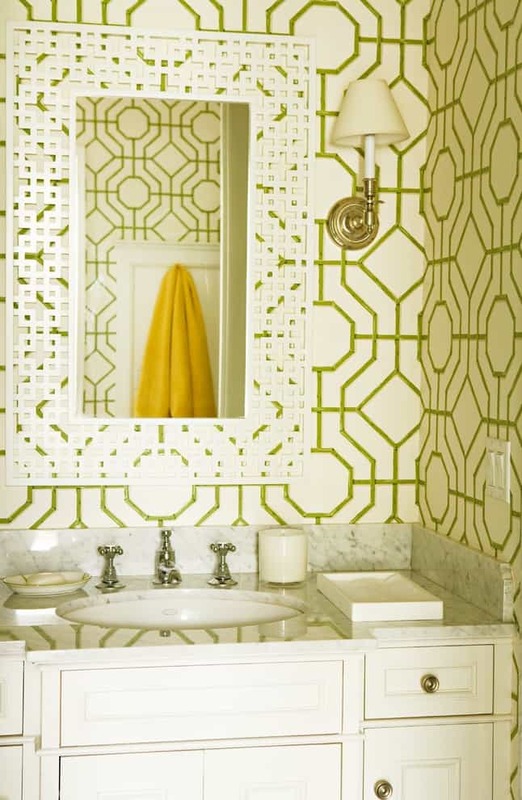 Keep the hot summer ongoing in your home with a warm cream and summery green trellis pattern. 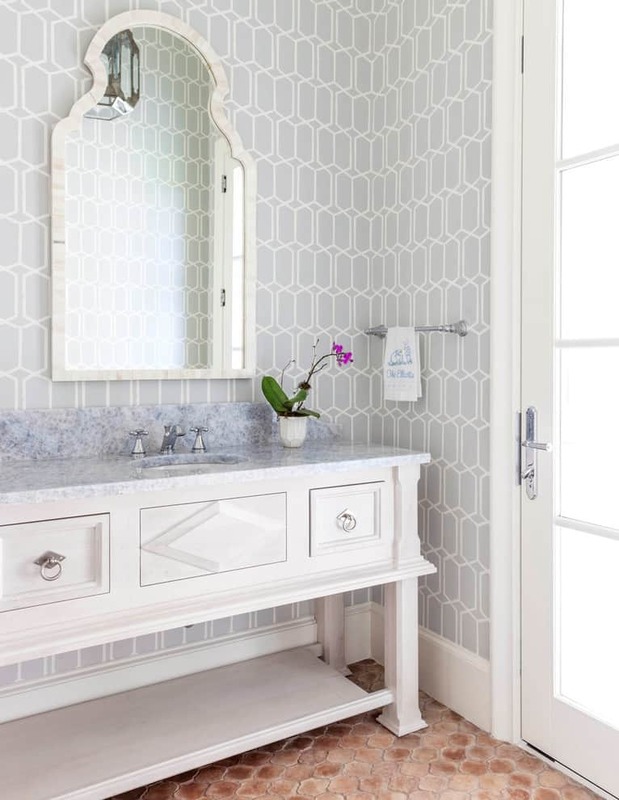 Rather than playing it safe and letting the walls star in the show, this designer has created more visual interest with an intriguing white lattice mirror over the mirror, marble splashed counter tops, and bright textile accents of sunny yellow. 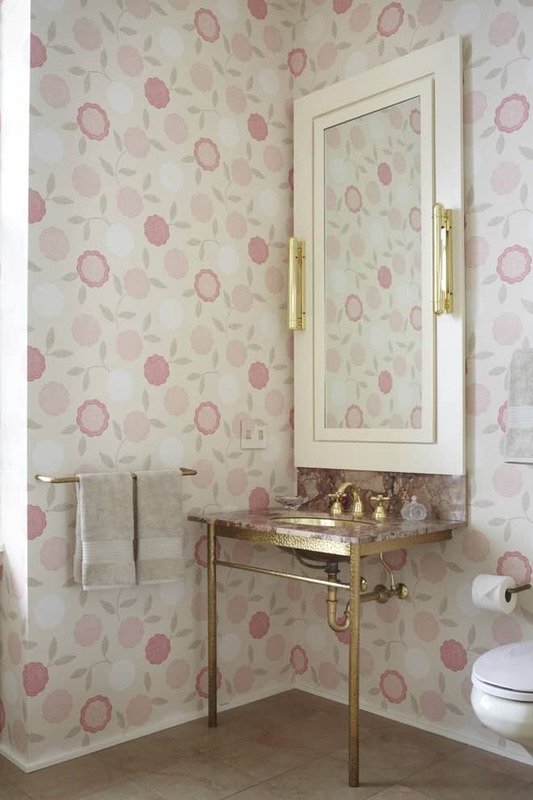 If you’re working with an add-on washroom to a feminine bedroom, this pretty pink and beige floral wallpaper is the loveliest of answers. 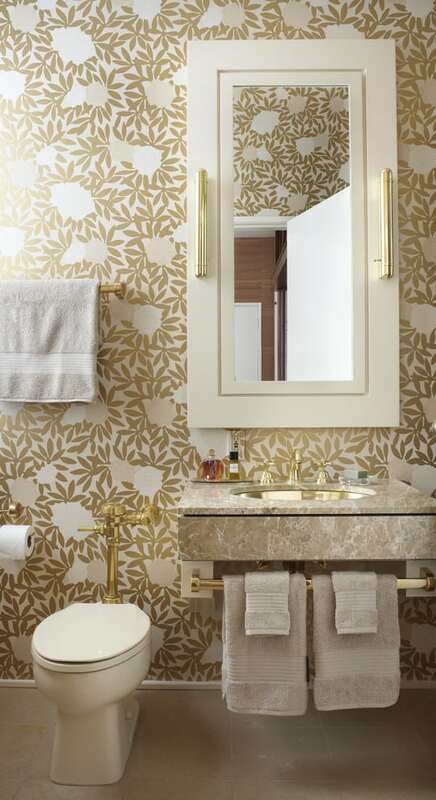 Add a touch of luxury and glamour with gorgeous gold hardware via towel racks or a beautiful vanity like this one. Finish the royal look off with glass or crystal soap dishes and cotton swab holder. 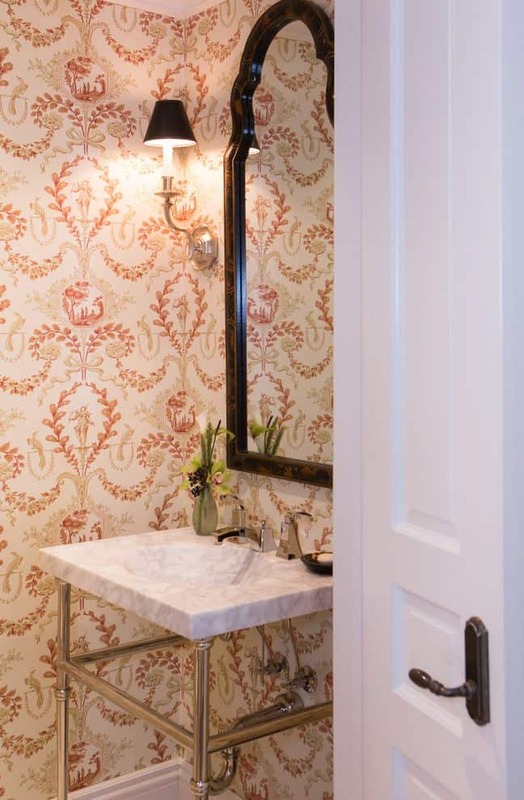 If you’re looking into more modern and suave styles, this ’60’s inspired powder room makes a bold but sophisticated statement. 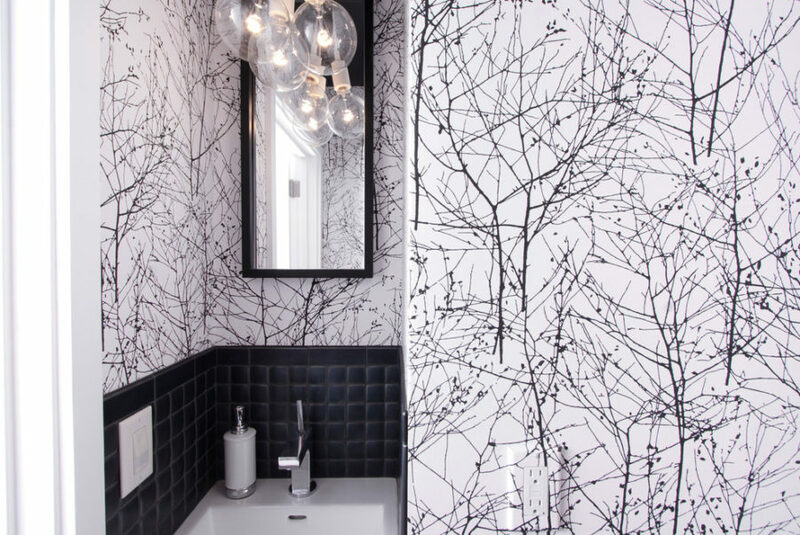 Sticking to a simple black and white colour palette, the walls are covered in a fractallike branch pattern that immediately intrigues the eye. The smaller scale of the twig pattern allows the white background to pop more avoiding any overwhelming sensation from occurring and the black tile around the sink adds a bit of graphic texture to this trendy space. 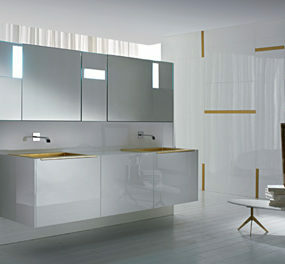 Build the ultimate luxury bathroom experience with a rich gold and cream scheme. This gorgeous Asuka wallpaper from Osborne & Little with stylized white peonies and metallic gold leaves sets the luxe tone. Continue the theme with gold fixtures and small accents like a gold tray for your favourite luxury perfumes. 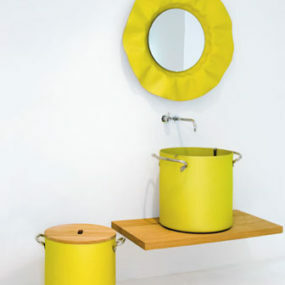 Brighten up a windowless powder room with a warm shade of marigold yellow splashed on the walls. A glass vase of tulips and a classy chandelier adds an element of chicness but the brown accents keep the room feeling more homey and down to earth. 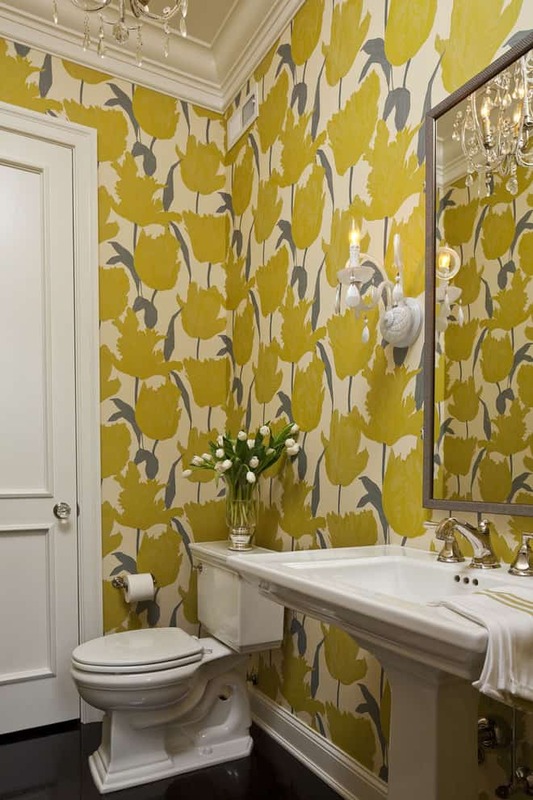 Add a little vintage glamour to your home with small scale floral patterned walls and a classic open skin. Hit up your local antique shop for a Victorian style mirror frame and wall mounted chandelier style lights to complete the look. 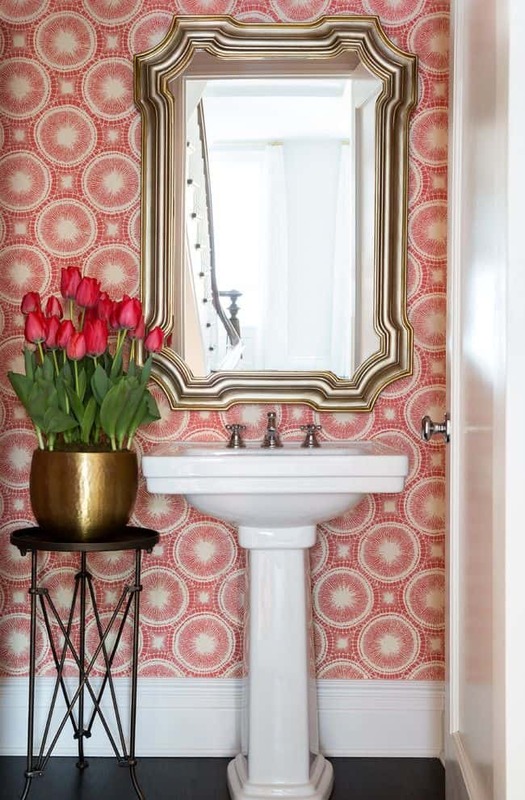 Stage a colourful moment with a vibrant powder room like this one to make your guests go “Wow!” The strong Moroccan tile inspired salmon-orange wallpaper makes a loud cultured statement that fills us with wanderlust to travel the world. We love the rich matte metallics from the mirror and large size vase of lush tulips and the modern geometric side table. Another stab at working with bold and colourful patterned wallpaper. 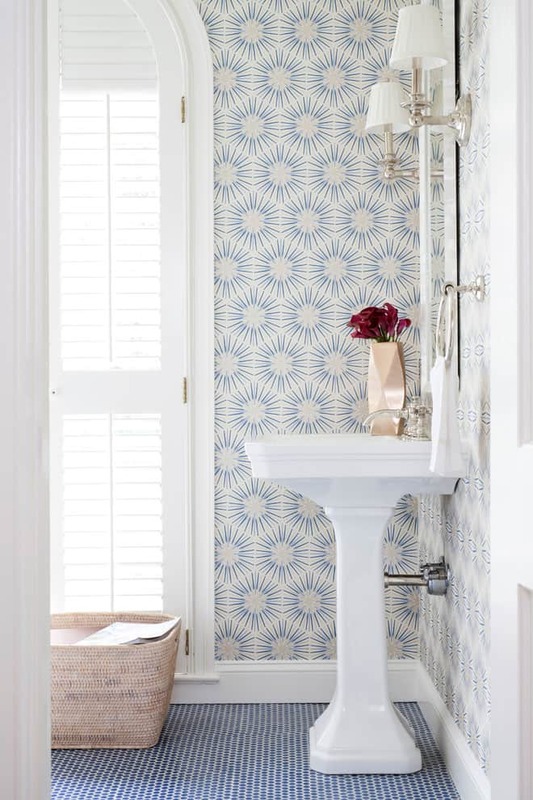 This powder room works a majestic royal blue seamless swirly leaf pattern with crisp white, silver, and rich brown accents. 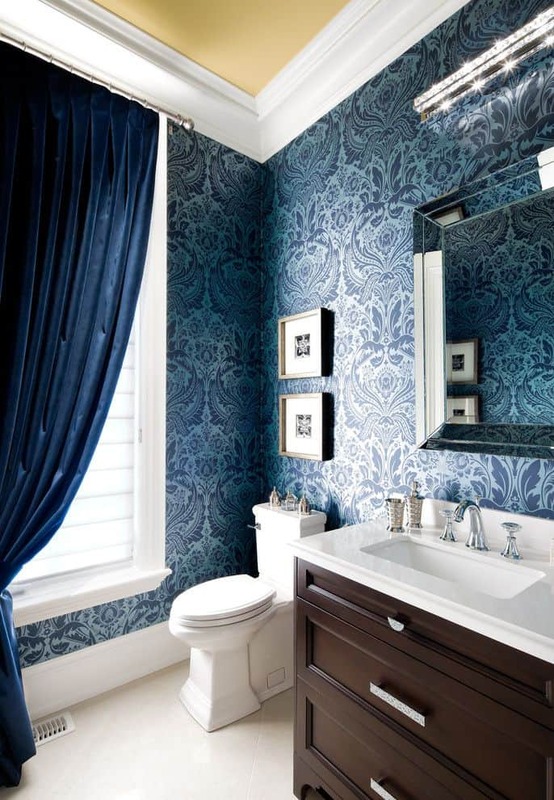 We love how the blue velvet curtains put the icing on the cake for a bathroom fit for queen/king. Thick white trim allows for a playful hidden pop of yellow on the ceiling to tone down the room’s seriousness. 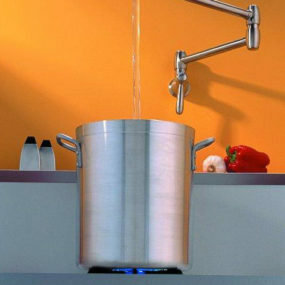 Thinking of putting a print up in your bathroom? 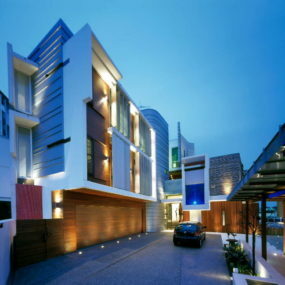 Let us know your design ideas and questions in the comments below!